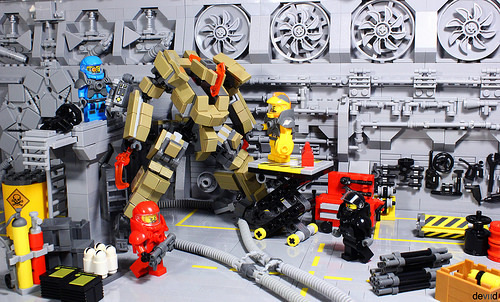 Dealing with the “situation” from an earlier build by Devid VII, the astronauts get their combat mech ready for action. There are so many tools, canisters and other industrial elements everywhere that I feel comfortable trusting them with anything. I can’t help but notice that the white one from before isn’t there anymore . . . fingers crossed for a third build that shows the resolution of this conflict!